Do you like to travel? It’s one of the things many people love to often do. Some people find it a bit of a drag but let’s face it, sometimes during the process of it you have to realize it’s a bit of a chore trying to accommodate to security check points and tedious long wait times and bothersome flight delays. But the end result is the arrival of the destination. Driving to another destination requires patience and good judgment of where you are going plus having the right items to take with you for the journey to another place. But have you ever thought about what are you going to do while your at a place with no cable or services for watching a movie? maybe your a gamer that wants to share your love for gaming with family and friends but have no TV or gaming equipment. This is where you have the option of choosing to bring portable devices on the road to accommodate yourself and others though good entertainment. Let’s say you have a portable projector but nowhere to display it and in a good place. Portable projector screens can be the answer you have been looking for. 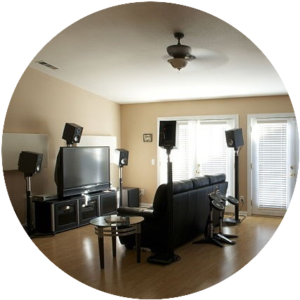 Most of these Projector screens tend to be very bulky and a mess to install but if you read on there are options to help you get the best one for your needs. What Type Of Portable Projector Screens Are You Looking For? It’s important to know what specific needs you have for a good portable projector screens. Many people tend to lend towards name brands and style. Don’t fall for this option. You want to first ask yourself this question above, then list out the things you need the most. Were going to take a look at some of the best projector screens with the specific quality, value and need. This will give you the most options to make a good decision on the portable projector screen you are look to buy. One of VIVO’s finest technologies, this screen is easy to set up using a tripod fold mechanism that has a no hassle break down and set to stand base. The screen it’s self is design with multi-layer matte white finish to prevent hot spotting, and the backing has a black finish texture to prevent light penetration. Do not worry abut compatibility issues because it’s made for DLP, LCD, and LED projectors. I love a 2 in 1 setup design, It’s what this article is all about. You can hang this on the wall of your living room then take it down within minutes package it up with a travel bag that is included with the screen and pull out the aluminum triangular prism legs to watch movies in the great outdoors. It’s durable enough to withstand moderate breeze plus you only need only two people for setup to display for hanging. This is perfect for travel in sedans. It’s wrinkle free, plus a 160 degree wide angle to watch 4k projections. The best part is you can easily carry it with you to where ever you need it most. A single nail installation for hanging which has a 4 hook design to fully support it’s 80 inch screens. Vamvo is so easy to set up, this is truly made for the outdoors. IT takes only 3 minutes to set up a total of 15 minutes for assemble and it requires no tools for building. Vamvo is made with lightweight material that has everlasting rope has a pipe and drape system for simplest design but high durably for outdoor elements. High quality fabric ensures great protection against tolerable impact. May needs to be ironed to smooth out wrinkles coming out the box due to folding but it’s great for travel in sedans as well. Double sided means you can use both sides for premium projection. It’s one of the best in the industry for wrinkle free protection. That means you can crumble it up and still have no issues with rips or tears. JDDZ is totally transportable but it may require a more setup time for good premium watching. It’s easy for setup and break down, and comes with 16 hooks and 5 meters of rope which can be displayed for home, office, church, and outdoor events. JDDZ is backed by a polyester projection screen material that gives you brighter imagery compared to other projection screens. You can really fold the screen and place it inside your brief case and store it inside your backpack for travel. The great about this screen is it’s totally inflatable and comes equipped with an air blower, rope tents and spikes for easy setup and carry bag. This screen is ready to go within two minutes! This projector screen is designed for huge major events or big family reunions. It’s the ultimate party travel machine to have on hand for major outdoor activities which can bring you a whole lot of fun and excitement for hours of fun. As you can see these portable projector screens have a particular type of use for your needs for travel. Remember it’s not about the brand or the popular pick, It’s about the type of need you have for these type of portable screens. Sometimes we get caught up in getting to know about the features which makes sense because it is what makes the so attractive. But you have to pay attention to the specifics that will determine if it’s what you need out a projector screen the most. When it comes to portable projector screens, it’s all about the specifics, and the size screen quality, weight and type of use will set you on the right path to knowing what exactly is the type of screen that is your most need. Those of us who wish to show a presentation for students or people have deadlines to meet and need a broad view to use power point to show to new clients what your bring to the table. Sometimes people use these type of portable screens to host a party. My personal favorite use is the Giant 14-foot screen for outdoor movie watching with friends and family. It’s a great idea to watch a good movie and take it back to the drive-thru theater style set which everyone could enjoy it. Many people think a smaller size portable projector screen could easily makeup for a HD projector with features that will accommodate to almost any screen, but you lose more quality to view images in high resolution and fine contrast in my opinion. you can get these portable screens in different sizes and for an affordable price, It’s just the fine print of what these screens specialize in to really qualify what you need in them the most. It’s okay to ask for more than your average size to enjoy more viewing features and amazing HD pictures but remember it’s all about what you need the most in these type screens. Let’s be honest, if you are planning on buying and projector screen, it makes sense to make sure the’s easy to watch and break down in within at least 5 to 10 minutes. Thirty minutes to a half hour is too long which in my opinion is not worth the money invested. The simplest way, the better. This could be a time crunch situation for you to realize this presentation must up and running with in minutes. That’s where you have the professional look and speed to place your portable screen in place to show the people what your have in seconds without even breaking a sweat. I think what could also change the game is the weight to carry them with no stress or strain to your body. I think I can speak for everyone when I say, nobody wants to haul around a 150 pound screen up a set of stairs or cram them into an elevator when there’re different ways to find a good portable screen that is travel friendly. Going on the road with a projector screen demands to have the right projector to any use you’re looking for. I know it’s a bit of a chore to search and find, but the difference between doing your homework and finding a good projector and portable screen for travel go hand in hand. There is so many different options to choose from with projectors as well. You can see different ideas and ways to broaden your creative theater setup in minutes just take a look around for portable and mini projectors. Each one has a specific type of need you could use in our busy world of travel. It’s more to do with you choice for selection, I would recommend looking for customer reviews for interest on a particular portable projector screens. Remember to always check the list of needs you may have and when searching for that new portable projector screen. You would need a good head start to discover ideas to find a good wireless projector, you could look into the Best projectors for your home theater which breaks down the different aspects of how to take advantage of a high quality system with little to no hassle for setup while saving money and time. It delivers all the quality options you may need on the road entertainment, gaming and presentation options. So we covered some options to give you an idea to find the ideal portable projector screen, now it’s time for you to make a decision on which one of these projectors screens can give you what you’re looking for. If would have found this article helpful please share your experience with us. But if your still on the fence about that ideal screen and need more information, give a comment below this article, maybe we could help you find out what is it you’re looking for. Plasma Flat Screen TV Good Or Bad To Buy?